The recent Russian WW2 drama Fortress Of War (Brestskaya krepost) tells the story of the heroic defence of the Brest fortress in Belarus that was assaulted by the Nazis on the morning of June 22nd 1941. Totally outnumbered in soldiers and weapons, the citizens of Brest fought to the bitter end for twenty-nine days. The events that took place in the first days of the invasion are depicted here with documentary accuracy and the film features unique footage of that time and the involvement of the few veterans who survived the battle. Directed by Alexander Kott and starring Andrey Merzlikin, Pavel Derevyanko and Veronika Nikonova, it's a tough film to research as it doesn't appear to have had much of a release oiutside of Russia and Belarus, but the user reviews on IMDb have ranged from cautiously positive to enthusiastic praise, and the overall user rating is an impressive 7.6 based on 1,783 votes at the time of writing. Here's hoping. The film also won three of Russia's prestigious Nika Awards and was nominated for Best Film. 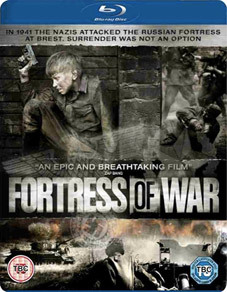 Fortress of War will be released on UK DVD and Blu-ray by G2 Pictures on 5th September 2011 at the RRP of £15.99 for the DVD and £19.99 for the Blu-ray.